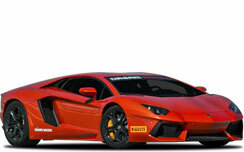 With its 700hp V12, the Aventador defies logic with speeds one would never think possible. It must be driven to appreciate its nearly limitless boundaries. 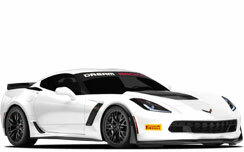 Satisfying America’s longing for a true American production Supercar. GM swings for the fences and produces the home run America has been waiting for. Ferrari’s 430 Scuderia is a faster, lighter, and more compelling version of the normal road going F430. Among street legal cars, the Scuderia sets the mark! With 550hp, front/rear independent double wishbone suspension, rear wheel drive, and E-gear transmission. The LP550 is a hands on driver’s dream. For a true race experience you have to drive a true race car, the F430GT is bred for the track and outclasses all of our supercars in every aspect. 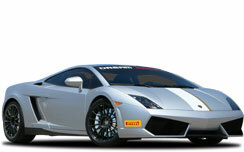 Our Lamborghini Gallardo LP 570-4 is right out of the Super Trofeo Race Series. With its superb handling and power, this race car is a must drive. With over 2,300 Cup Cars built by Porsche since the car's introduction in 1993, our Porsche GT Race Car proves that Porsche is as serious about sports car racing as it ever was. 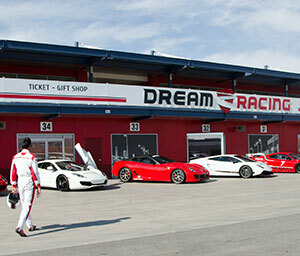 Dream Racing is the new five-star driving experience at Las Vegas Motor Speedway and the only one where you can get behind the wheel of a real Ferrari race car. Fast, Italian, exhilarating. An all inclusive experience that shows you what it means to be a race car driver. No matter which package you choose, we promise to deliver you a once in a lifetime experience. Don’t miss this unique opportunity. The racing experience starts by suiting up in a professional race suit and helmet. Then learn the curves in a state-of-the-art simulator session where the Las Vegas racetrack has been laser scanned to exact specifications. Nowhere else in the world will you find such a driving experience. We knew this experience could only take place on a real track with a real racing car. The real challenge was to develop an experience, from beginning to end, that was complementary to the Ferrari lifestyle and synonymous with its name. After having hosted multiple corporate events and team building activities we can confidently say that this goal has been achieved. A: Not at all. Whether you choose our racing Ferraris or one of our street legal cars, all are equipped with a no-clutch paddle shift and feature racing ABS and traction control. The racing cars, because they are built and set-up for the track, are more responsive and predictable. 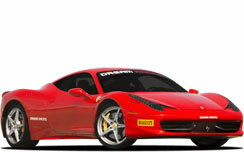 You will have a dedicated instructor assisting you from the simulator session to the track. He’ll be there to make your experience as enjoyable as possible, encouraging you to get the maximum out of the racing car but will never push you beyond your comfort level. You determine the speed inside the car. A: Yes, insurance is included in every Dream Racing package. You will be asked, however, to sign a waiver upon arrival. Click here to see the waivers you will be asked to sign. A: The time to complete the race car experiences up to 7 laps and 1 driving session is approximately 2 hours. If you are using our complimentary transportation (available only for race car experiences) add about an hour for the round trip from and to the City Center. The Hot Laps Experience, which doesn’t include transportation service, is completed in less than 30 minutes. A: The first lap is the one exiting the pits. When the car passes the first time on the straightaway, in front the pit lane, it will begin its second lap. 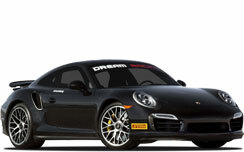 A: Dream Racing™’s call center is open 7 a.m. to 6 p.m. PST seven days a week. Feel free to contact us by phone (702) 605-3000, or by email info@dreamracing.com. A: Lunch is not provided. However, Dream Racing™ does have a lounge where small snacks and beverages are available. A: You will not have to pay for the car’s damages if you are involved in a wreck. All insurance is included in the package prices. A: Yes. If during your driving experience you come up on a slower car, your instructor will guide you through passing the slower car. A: The experience is very intense. Imagine a Bungee jump that lasts for minutes! Also, if you’re passionate about racing, you know how much work pro race car drivers can put in for sometimes just one qualifying lap. The experience starts with your classroom training session and includes the simulator session. The laps on track, in the racing Ferrari, are the highlight of your experience, but certainly not the entire experience which takes much longer. A: Time on the track is based on the package you select. The driving time will be approximately 6 to 9 minutes to complete 5 laps. Please note that your total driving time will depend on your ability as well as the speed you are comfortable driving at. A: No. The only passenger allowed in the race car is your professional instructor who will be with you throughout the driving portion of your experience. A: Of course! You are welcome to bring three (3) guests with you. A: We recommend that you wear comfortable clothes. You are required to wear closed-toed shoes in order to drive. We recommend your favorite pair of sneakers. Racing shoes and gloves are included in our Dream Racing Ultimate and Full Throttle Experiences and are otherwise available to purchase in our gift shop prior to your experience. A: No, the Hot Laps experience does not include classroom training and simulator session but will give you access to the Dream Racing™ Lounge, with refreshment bar. During your Hot Lap driving experience you will however be required to wear the helmet with intercom for optimal communication with the instructor driving the car. A: Once you arrive at the race track you will be taken to the Registration Desk to complete the remaining paperwork for your experience. A: Yes, if you choose any of our experiences, complimentary round trip transportation is provided for you and one additional guest from Crystals at CityCenter to the Las Vegas Motor Speedway. A: Your experience will take place on the 1.2 mile road course located in the infield of the Las Vegas Motor Speedway, surrounded by the world famous superspeedway. A: Yes. 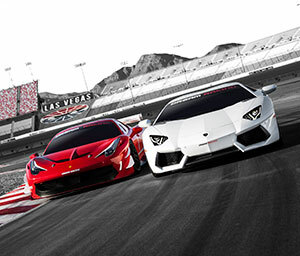 The Las Vegas Motor Speedway is the only place in the world offering the Dream Racing™ Experience. If you choose one of our “Street Car Experiences” you will choose between our selection of exotic cars such as Porsche Carrera S, McLaren MP4-12c, Lamborghini Gallardo Superleggera, Ferrari 458 Italia, Ferrari 599 GTB Fiorano, Nissan GTR, Lamborghini Huracán, Porsche 911 GT3, Lamborghini LP550-2, Ferrari 430 Scuderia, Porsche Cayman GTS, Lamborghini Aventador, Mercedes SLS AMG, Corvette C7 Stingray, and the Audi V10 R8. 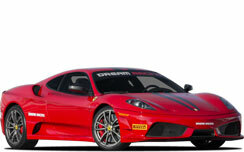 A: With 5-star amenities, professional driving instructors, 3-D simulators, precision tuned racing F430 GT Ferraris, and the largest fleet of exotic cars in the world, Dream Racing™ provides a unique driving experience that, for quality and value, can’t be found anywhere else in the world. A: If you are using Dream Racing™’s complimentary transportation you will have to wait for the next available transport, or find another mode of transportation to get to the race track. Should this or something else cause you to you miss the start of your experience at the race track (i.e. theclassroom or simulator) you will have to wait for the next session to start, and join them. A: Dream Racing™ is open even in the rain. Our cars will be equipped with racing rain tires.